Thank you for interest in translating using Weblate. Projects can be either be set up for direct translation, or by way of accepting suggestions on behalf of users without accounts. Please see Translation workflows for more info on translation workflow. 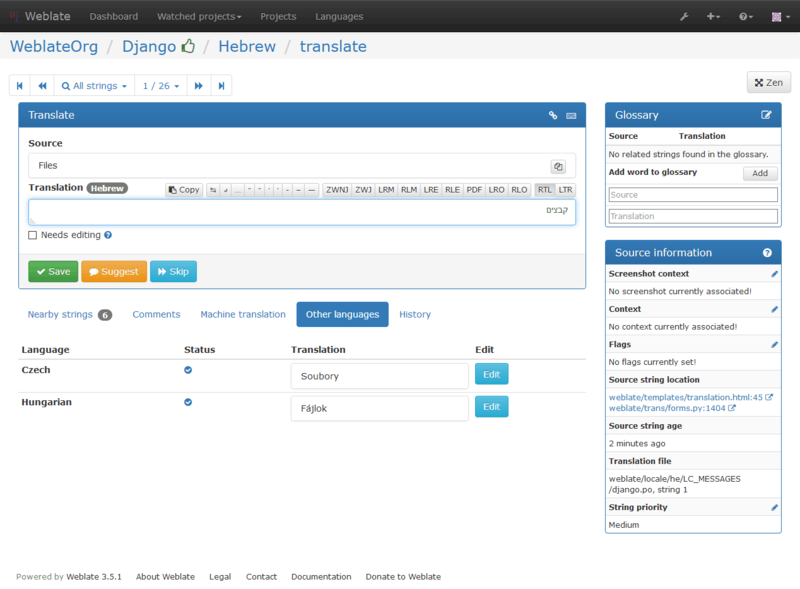 Translation projects hold related components, related to the same software, book, or project. Having navigated to a component, a set of links lead to actual translation. The translation is further divided into indivudual checks, like “Untranslated” or “Needing review”. If the whole project is translated, without error, “All translations” is still available. Alternatively you can use the search field to find a specific string or term. Anonymous users can only (if permitted) forward suggestions. Doing so is still available to logged in users, in cases where uncertainty about the translation arises, which will prompt another translator to review it. Permissions might vary depending on your setup, the following describes the default behaviour of Weblate. On the translation page, the source string and an edit area for translating it is shown. Should the translation be plural, multiple source strings and edit areas are shown, each described and label in plural form. Any special whitespace chars you will find underlined in red and indicated with grey symbols. More than one subsequent space is also underlined in red to alert the translator to its formatting. Various bits of extra info can be shown on this page, most which comes from the project source code (like context, comments or where the message is being used). When you choose secondary languages in your preferences, translation to these languages will be shown (see Secondary languages). Below the translation, any suggestions made by others will be shown, which you can in turn accept, accept and make changes, or delete. Words that change form to account of their numeric designation are called plurals. Each language has its own definition of plurals. English, for example, supports one plural. In the singular definition of for example “car”, implicitly one car is referenced, in the plural definition, “cars” two or more cars are referenced, or the concept of cars as a noun. Languages like for example Czech or Arabic have more plurals and also their rules for plurals are different. Weblate has full support for each of these forms, in each respective language by translating every plural separately. The number of fields and how it is used in the translated application depends on the configured plural equation. Weblate shows the basic info, but you can find a more detailed description in the Language Plural Rules by the Unicode Consortium. Changed in version 2.18: The keyboard shortcuts have been revamped in 2.18 to less likely collide with browser or system defaults. A small visual keyboard is shown when translating. This can be useful for typing chars not usually found or otherwise hard to type. This contextual description provides related info about the current string. Can be uploaded to Weblate to better inform translators of where and how the string is used, see Visual context for strings. Displays neighbouring messages from the translation file. These are usually also used in a similar context and prove useful in keeping the translation consistent. Messages found to be similar the current source string, which helps in providing a consistent translation. In case a message appears in multiple places (e.g. multiple components), this tab shows all of them if found to be inconsistent (see Inconsistent), you can choose which one to use. Displays terms from the project glossary used in the current message. List of people whom have changed this message recently using Weblate. 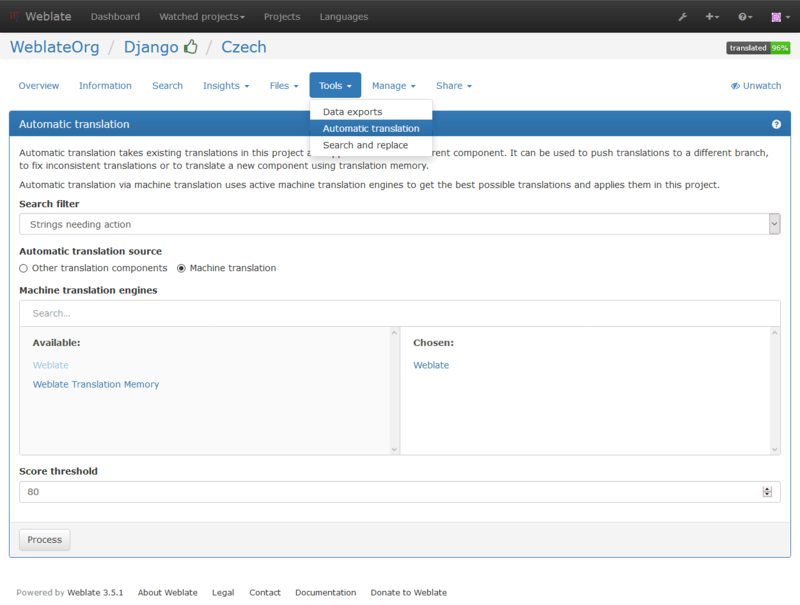 Project info like instructions for translators, or info about its version control system repository. If the translation format supports it, you can also follow supplied links to respective source code containing each source string. Every change is by default (unless turned off in component settings) saved in the database, and can be reverted. 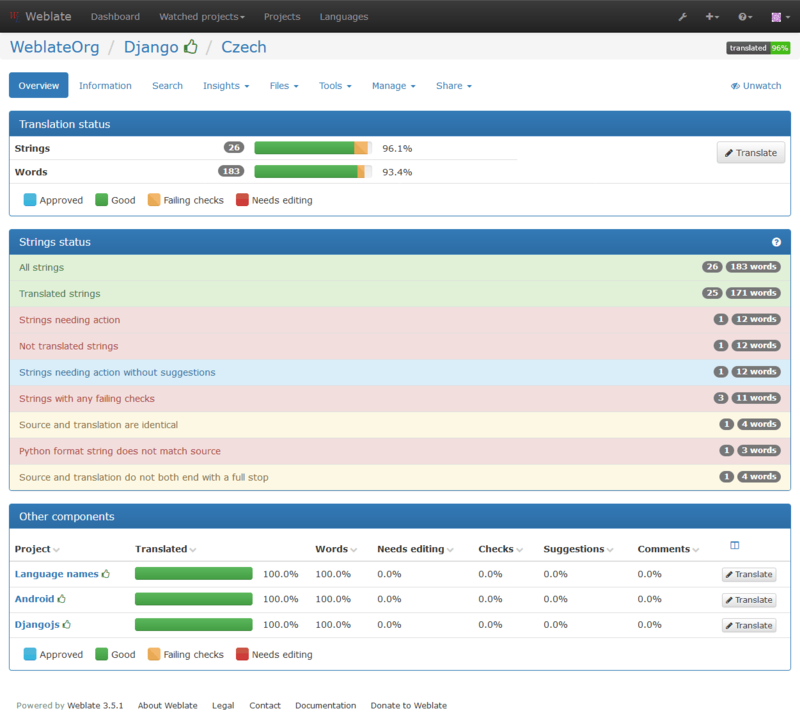 Optionally one can still also revert anything in the underlying version control system. Each project can have an assigned glossary for any language as a shorthand for storing terminology. Consistency is more easily maintained this way. Terms from the currently translated string can be displayed in the bottom tabs. On the Glossaries tab of each project page, you can find a link that reads Manage all glossaries, wherein you can start new glossaries or edit existing ones. Once a glossary exists, it will also show up in this tab. Based on configuration and your translated language, Weblate provides you suggestions from several machine translation tools. 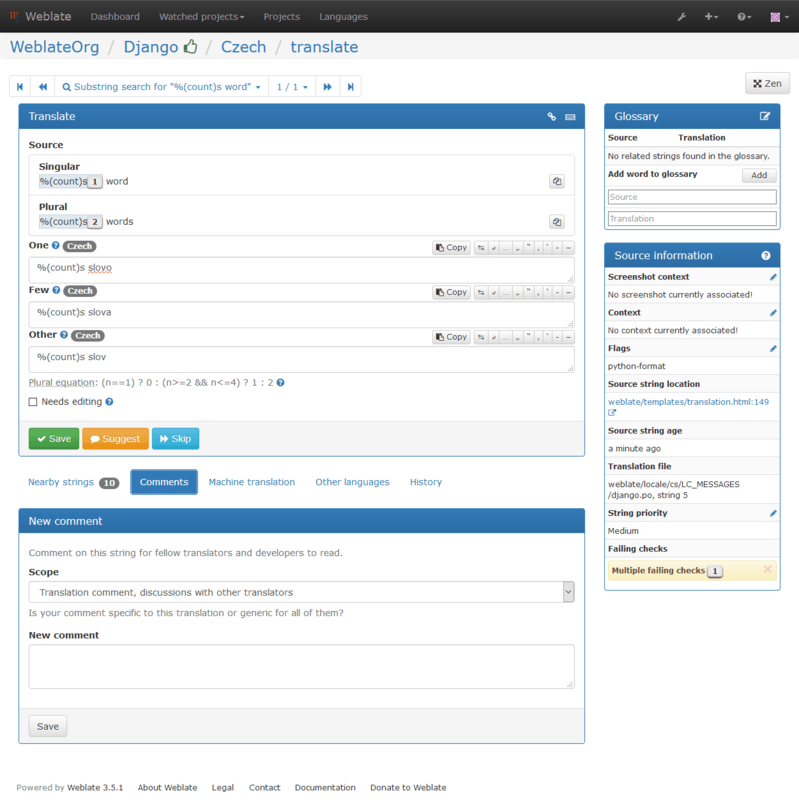 All machine translations are available in a single tab of each translation page. You can find list of supported tools in Machine translation. Using other Weblate components as a source for translations. Using selected machine translation services with translations above a certain quality threshold. You can also choose which strings are to be auto-translated. Be mindful that this will overwrite existing translations if employed with wide filters such as All strings. Useful in several situations like consolidating translation between different components (for example website and application) or when bootstrapping translation for a new component using existing translations (translation memory). To avoid abuse of the interface, there is rate limiting applied to several operations like searching, sending contact form or translating. In case you are are hit by this, you are blocked for certain period until you can perform the operation again. The default limits are described in the administrative manual in Rate limiting, but can be tweaked by configuration.